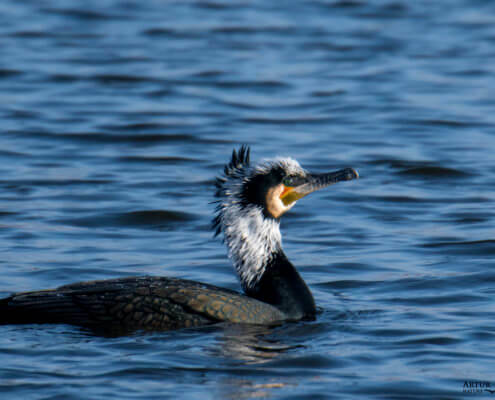 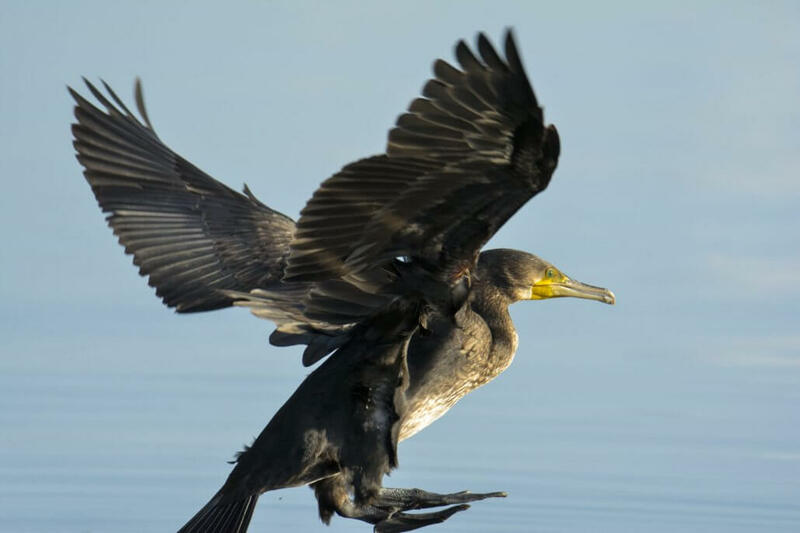 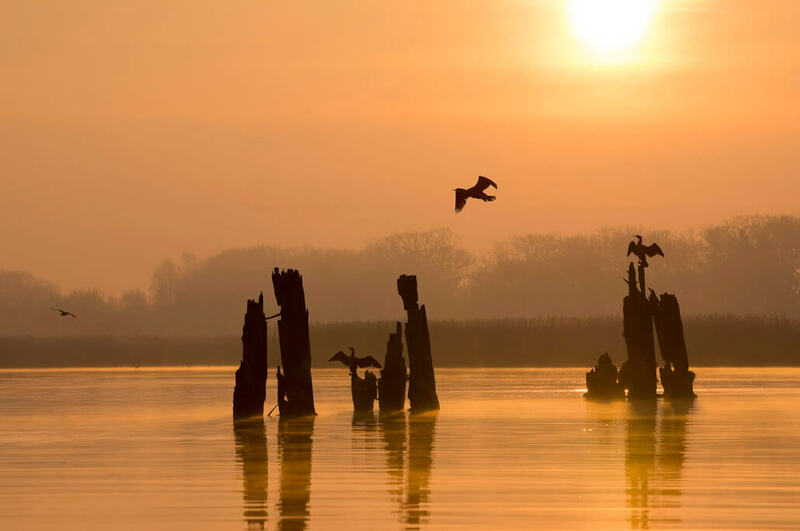 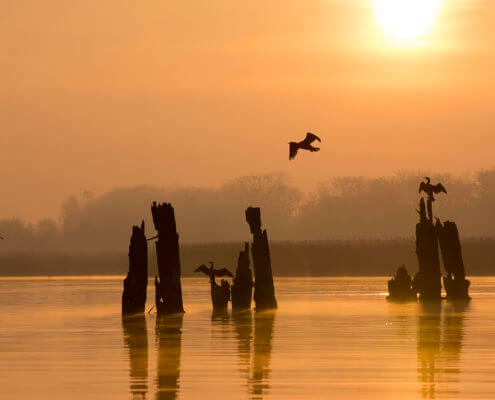 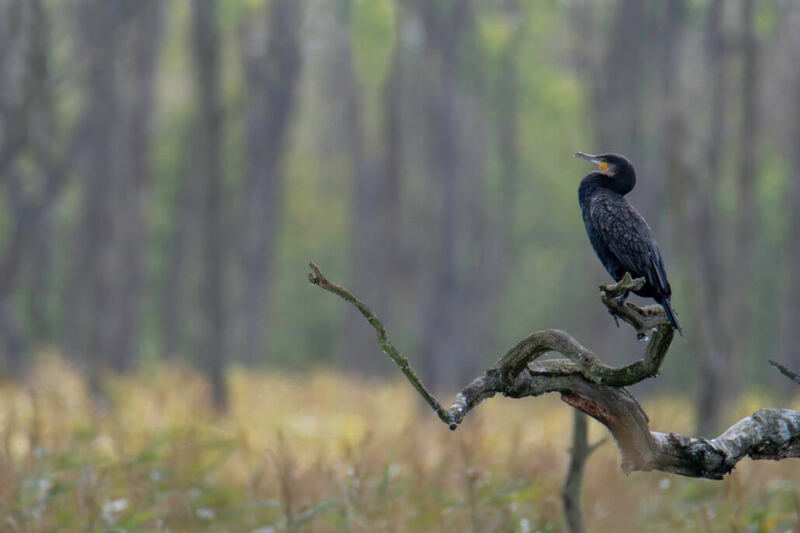 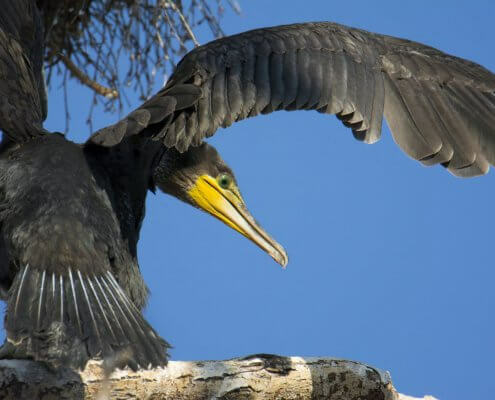 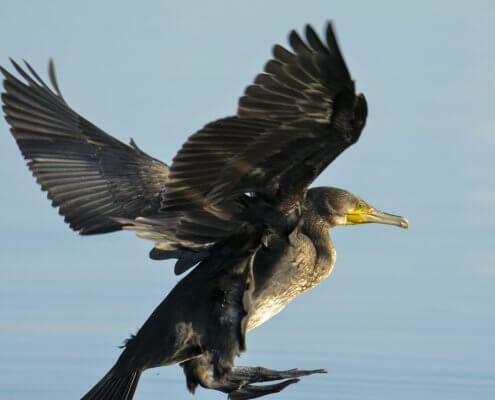 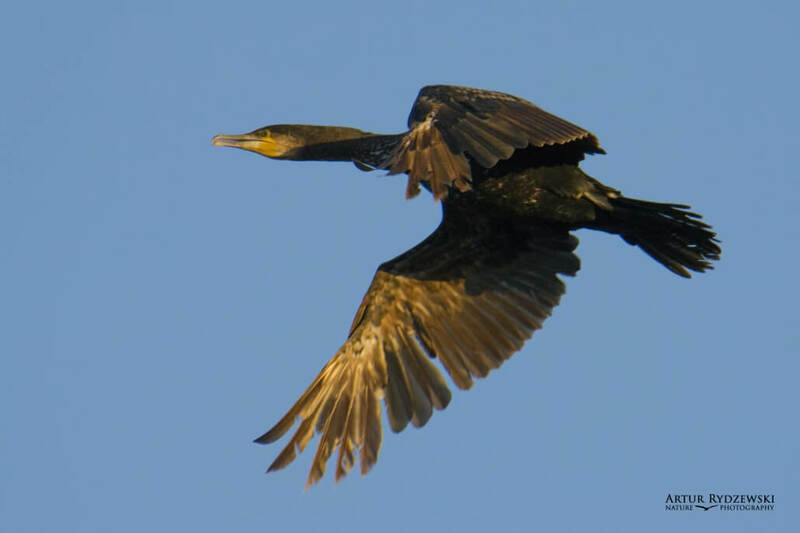 The great cormorant – Phalacrocorax carbo, known as the great black cormorant across the Northern Hemisphere, the black cormorant in Australia, the large cormorant in India and the black shag further south in New Zealand, is a widespread member of the cormorant family of seabirds. 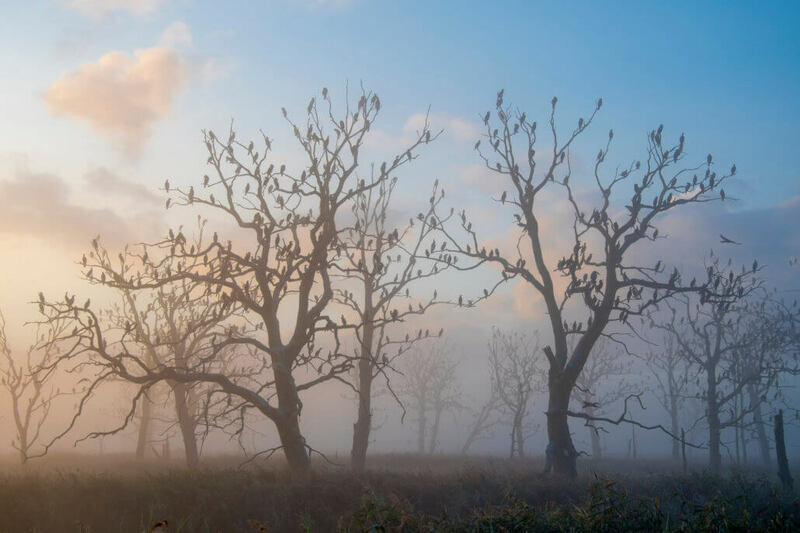 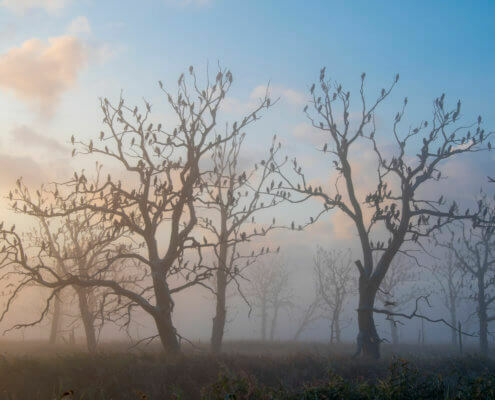 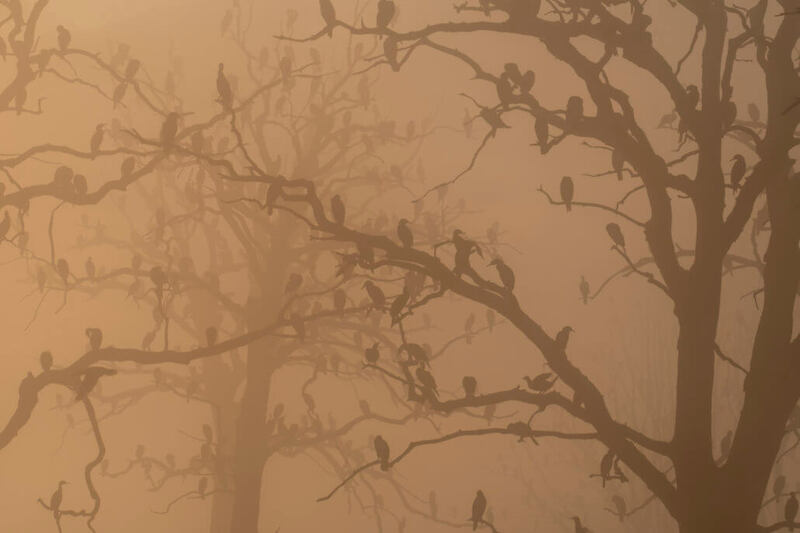 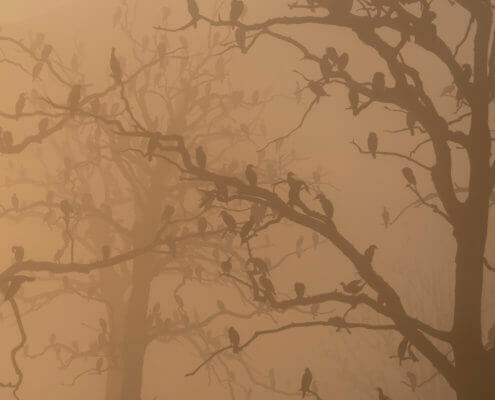 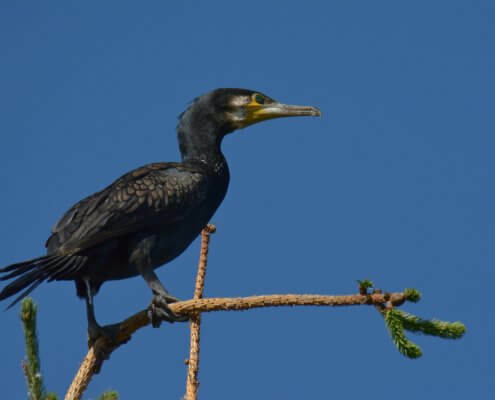 The genus name is Latinised Ancient Greek from φαλακρός (phalakros, “bald”) and κόραξ (korax, “raven”), and carbo is Latin for charcoal. 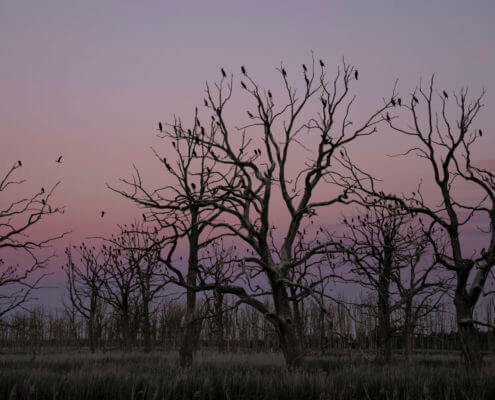 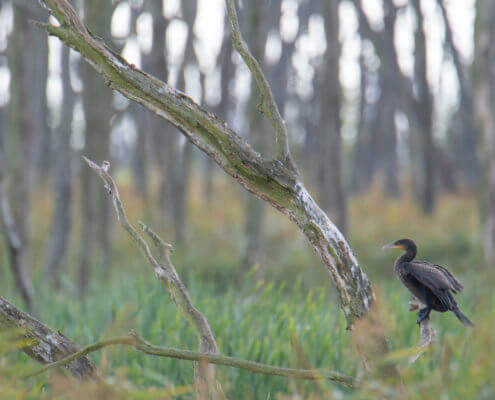 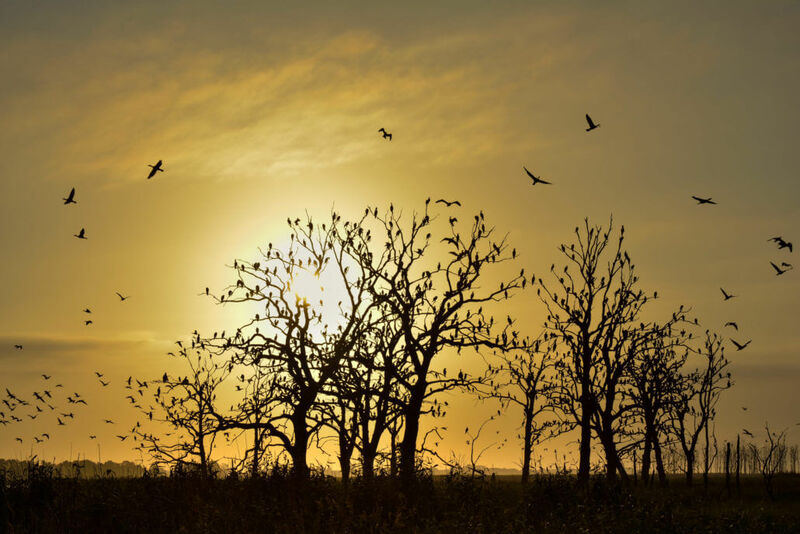 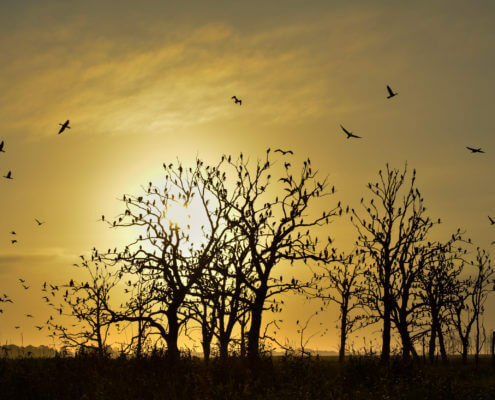 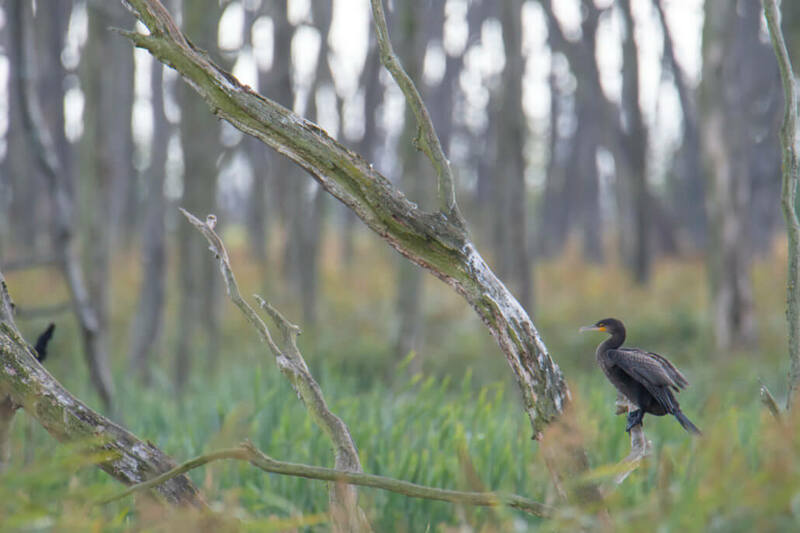 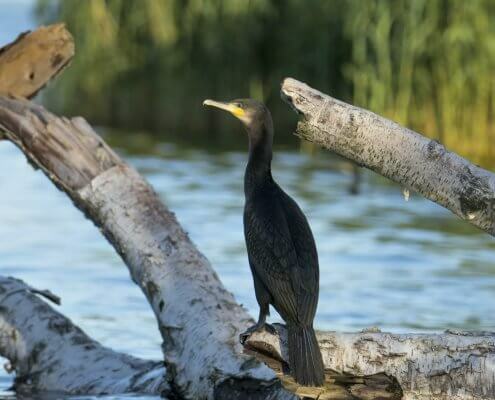 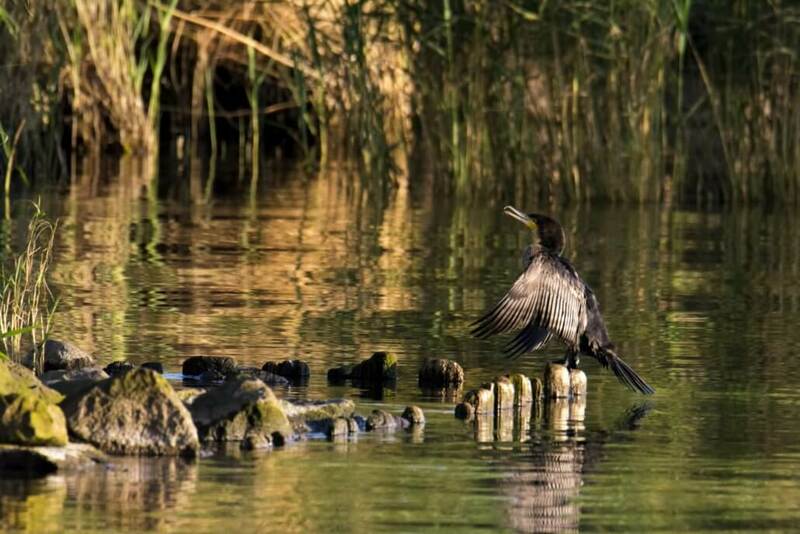 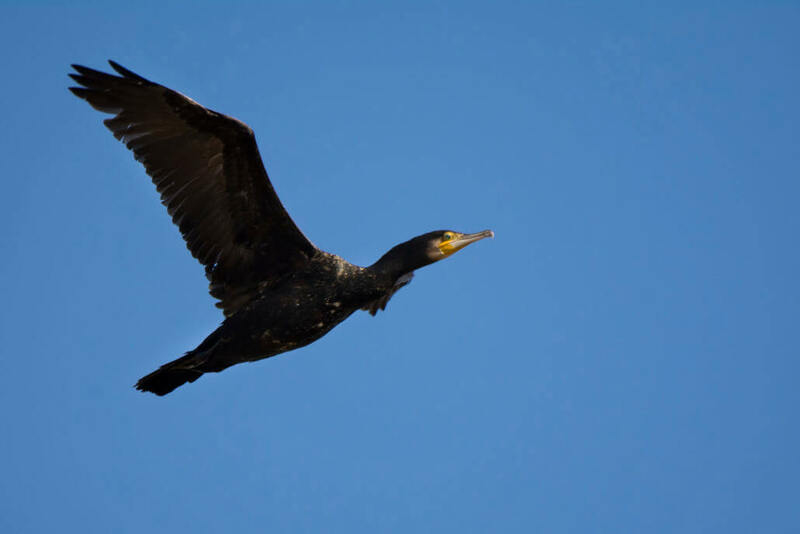 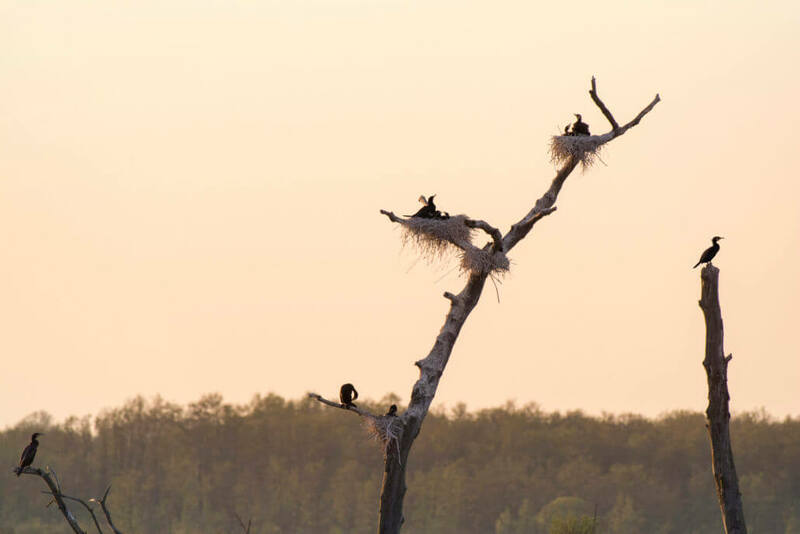 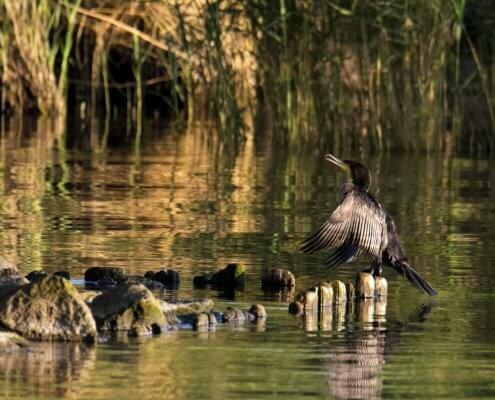 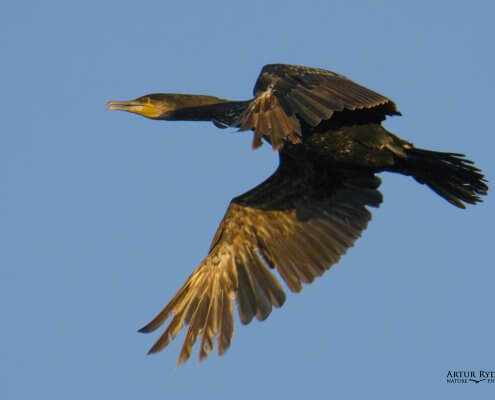 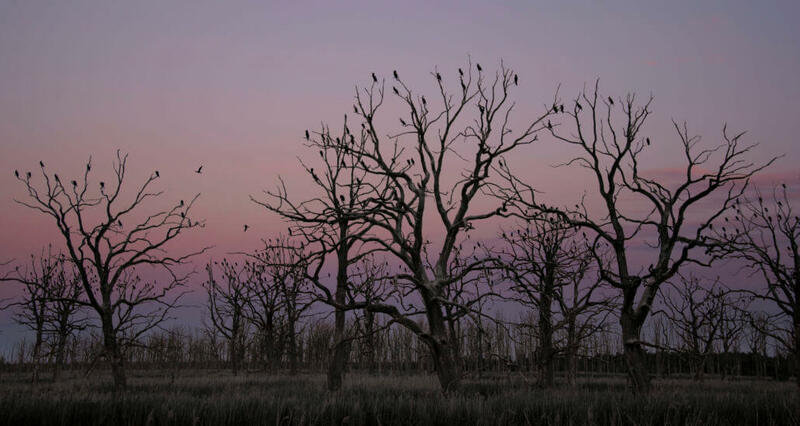 The great cormorant is a large black bird, but there is a wide variation in size in the species wide range. 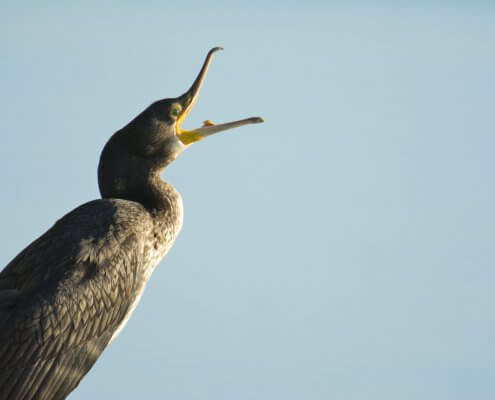 Weight is reported to vary from 1.5 kg (3.3 lb) to 5.3 kg (12 lb). 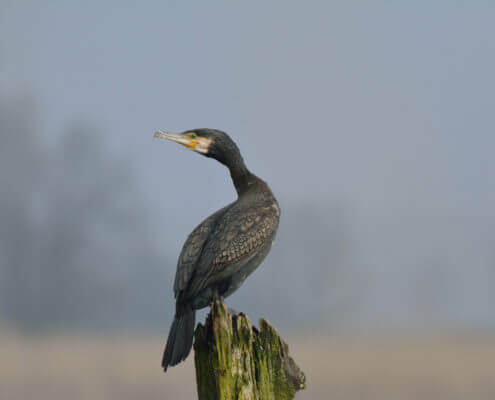 Males are typically larger and heavier than females, with the nominate race (P. c. carbo) averaging about 10% larger in linear measurements than the smallest race in Europe (P. c. sinensis). 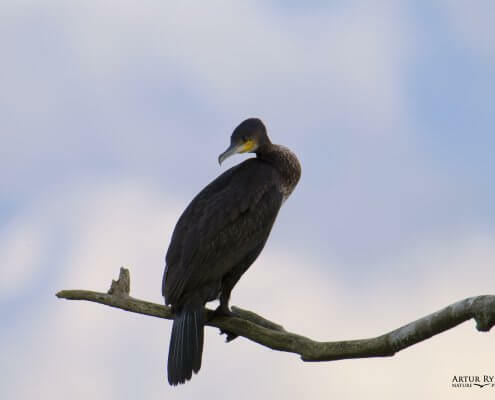 The lightest average weights cited are in Germany (P. c. sinensis). 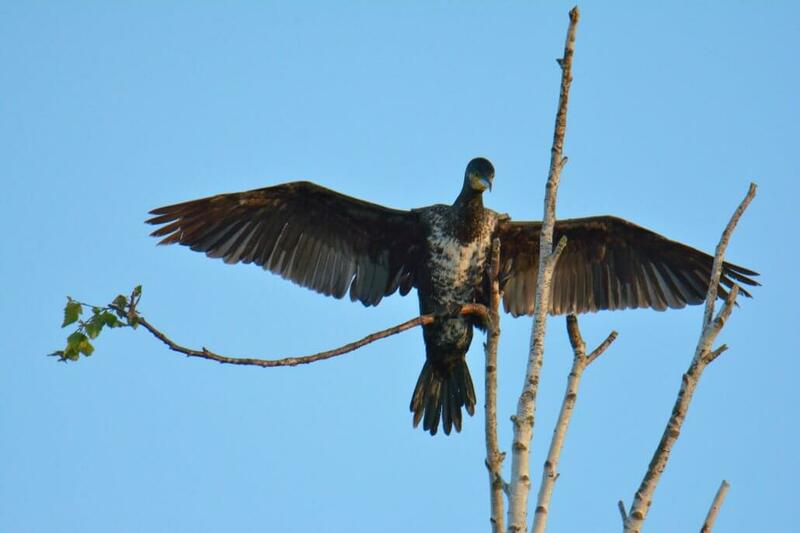 The highest come from Prince Edward Island in Canada. 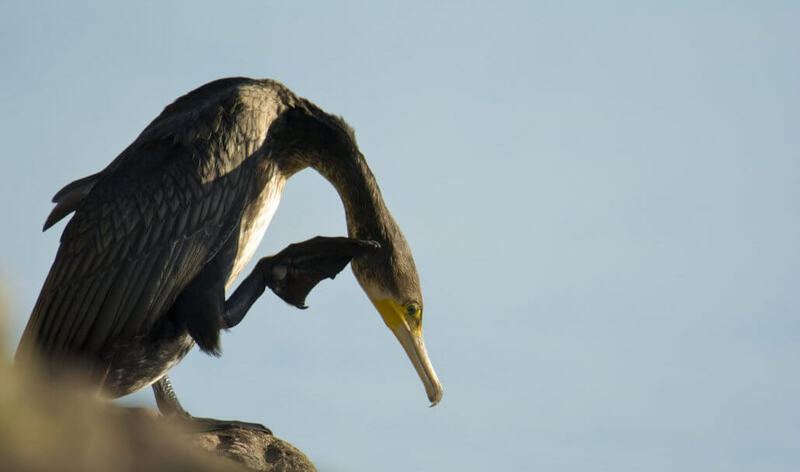 Length can vary from 70 to 102 cm (28 to 40 in) and wingspan from 121 to 160 cm (48 to 63 in). 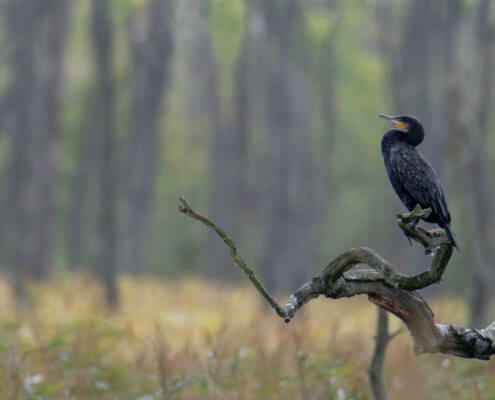 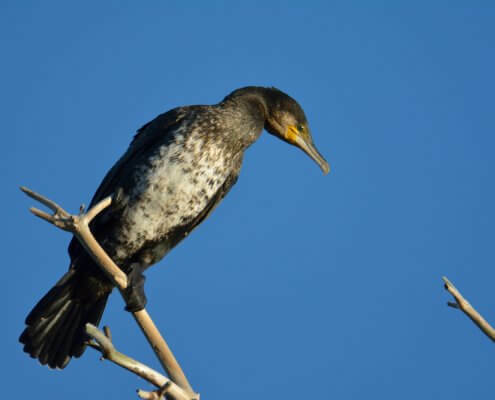 They are tied as the second largest extant species of cormorant after the flightless cormorant, with the Japanese cormorant averaging at a similar size. 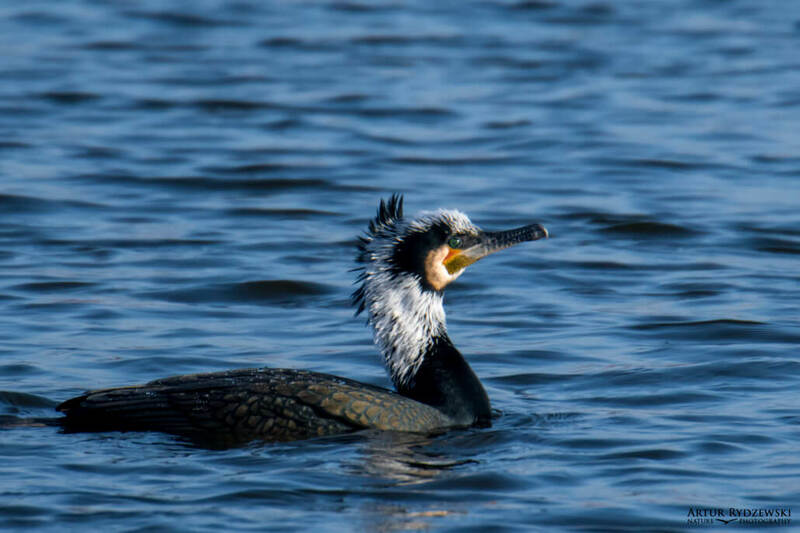 In bulk if not in linear dimensions, the Blue-eyed shag species complex of the Southern Oceans are scarcely smaller at average. 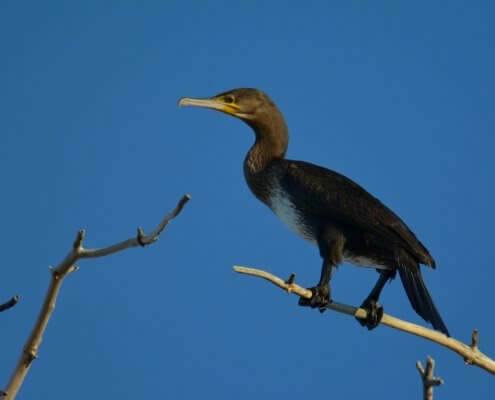 It has a longish tail and yellow throat-patch. 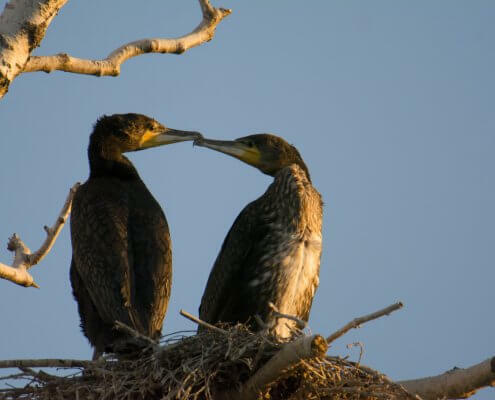 Adults have white patches on the thighs and on the throat in the breeding season. 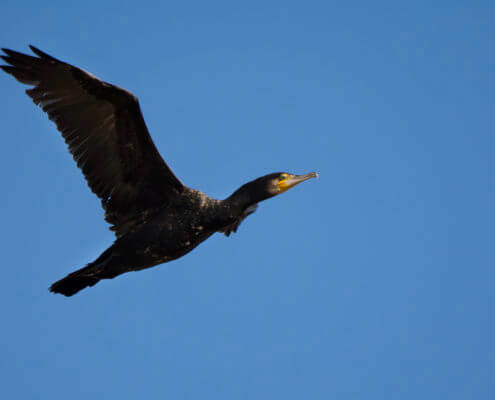 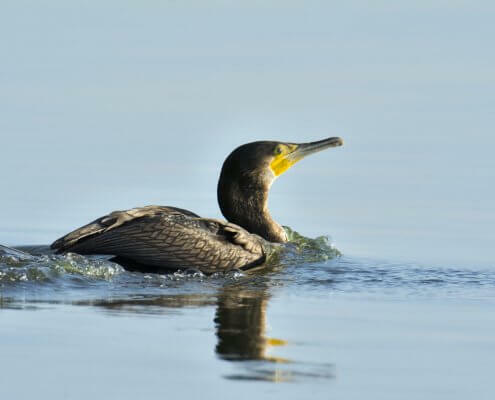 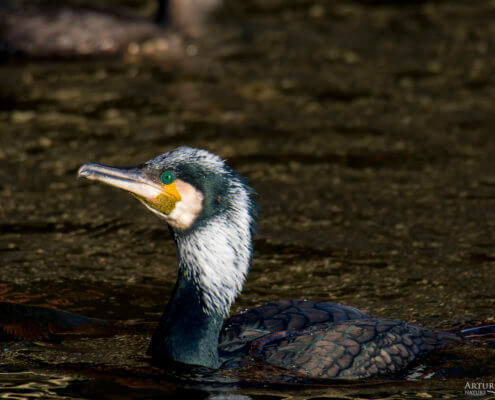 In European waters it can be distinguished from the common shag by its larger size, heavier build, thicker bill, lack of a crest and plumage without any green tinge. 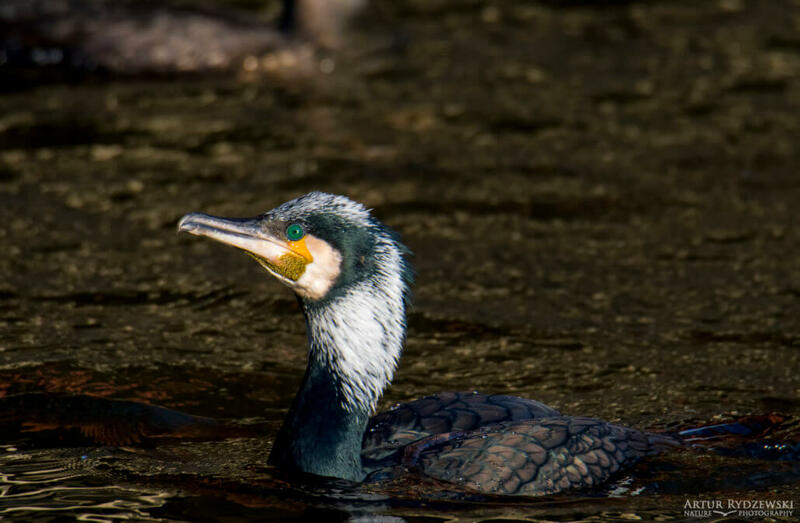 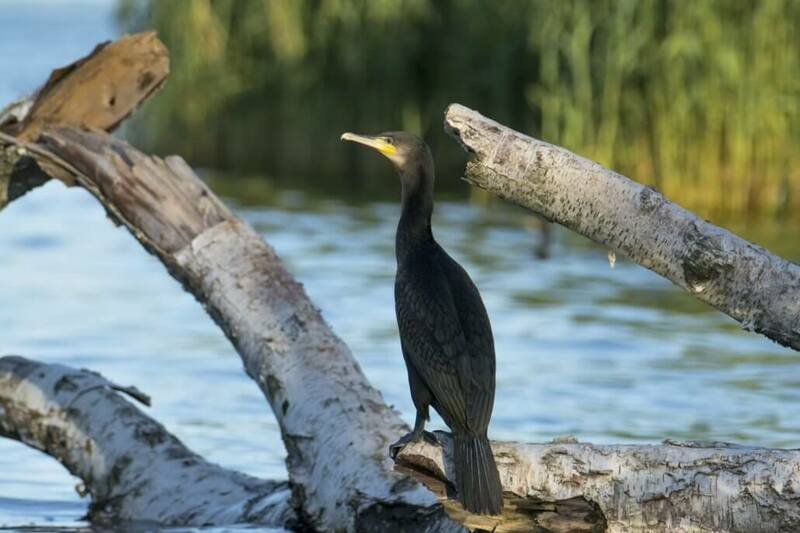 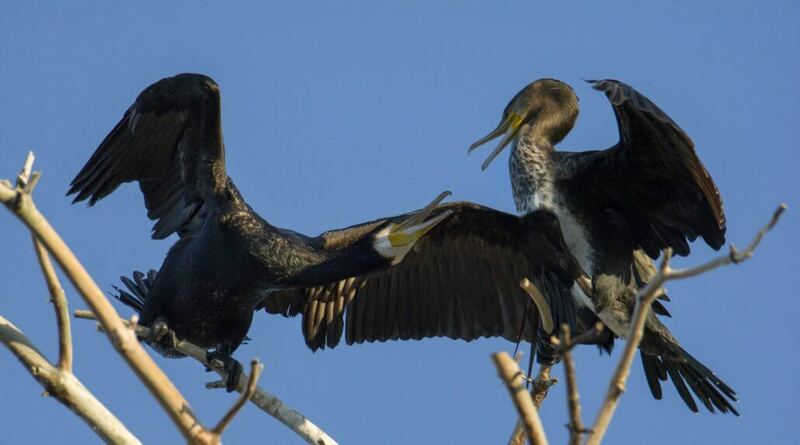 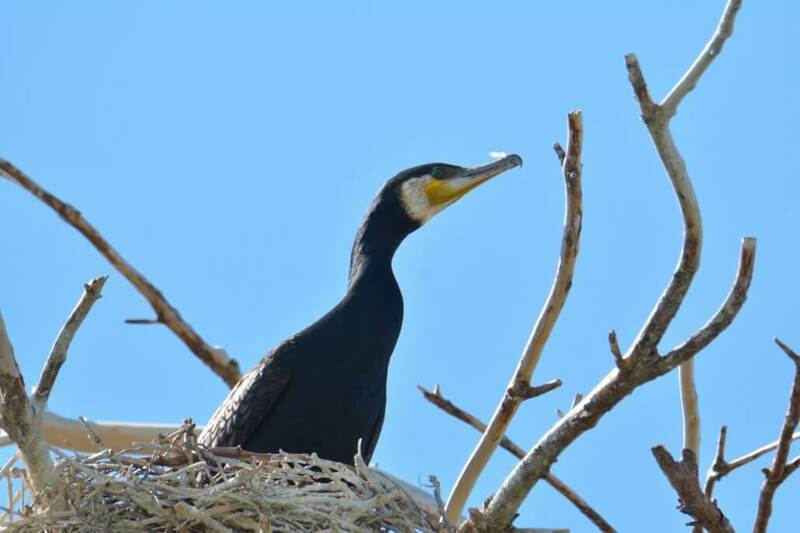 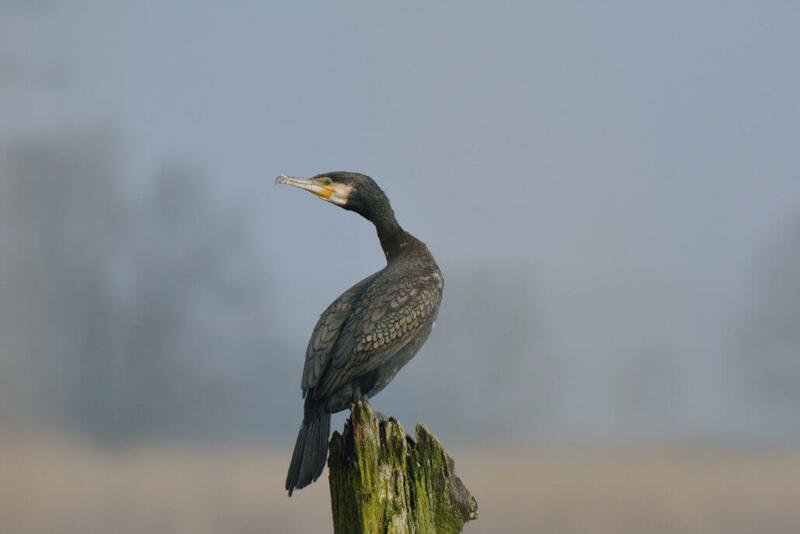 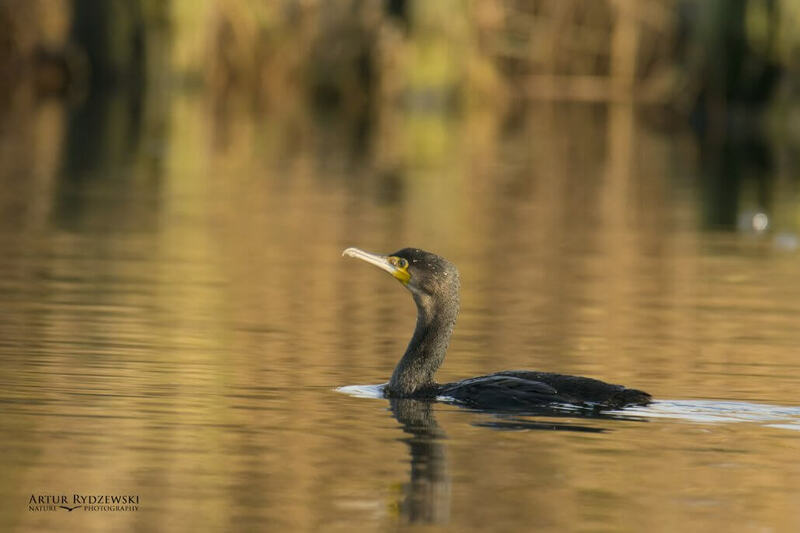 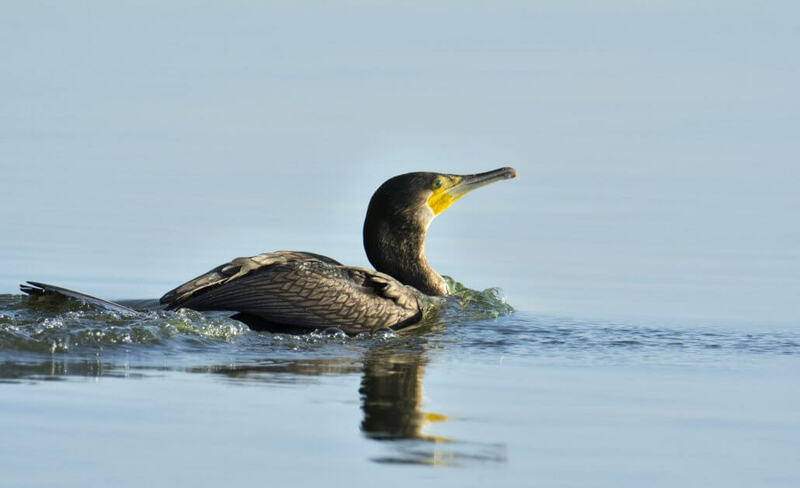 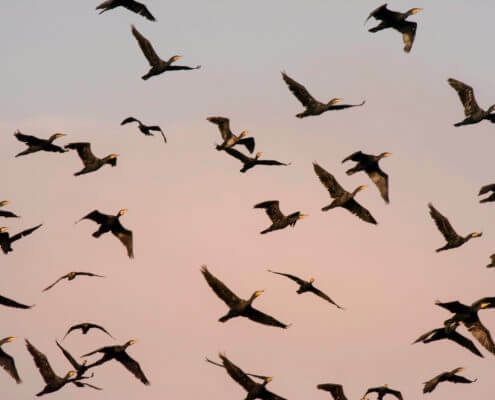 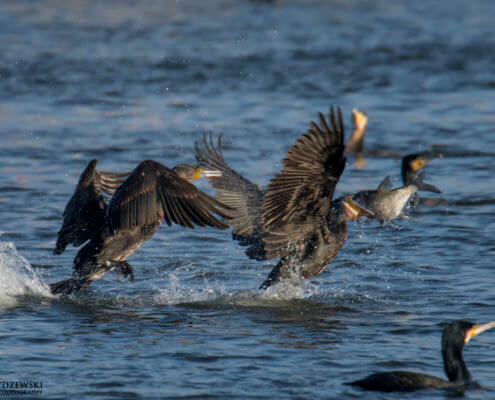 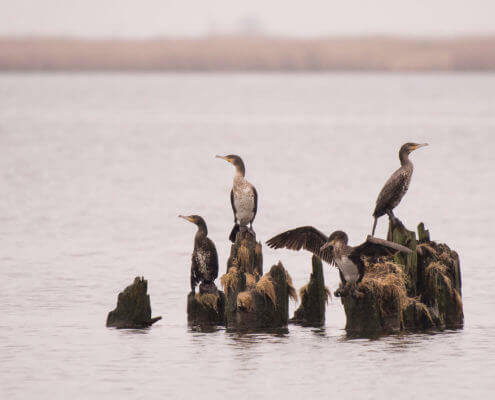 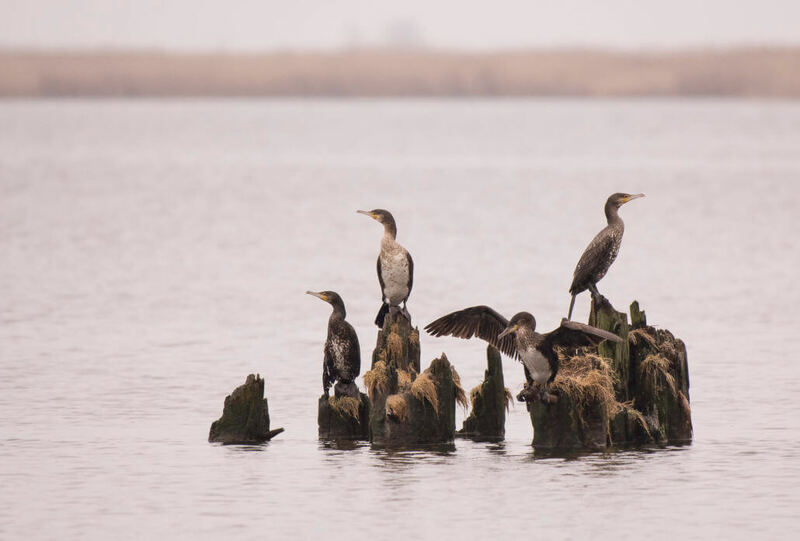 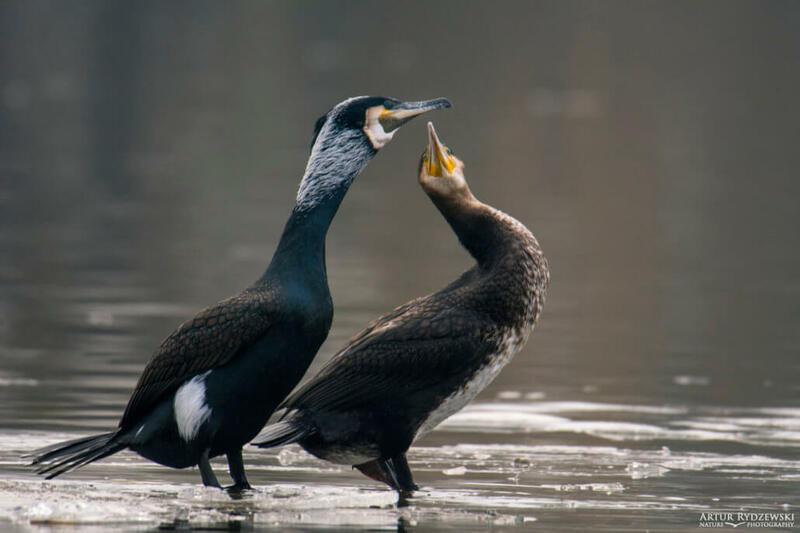 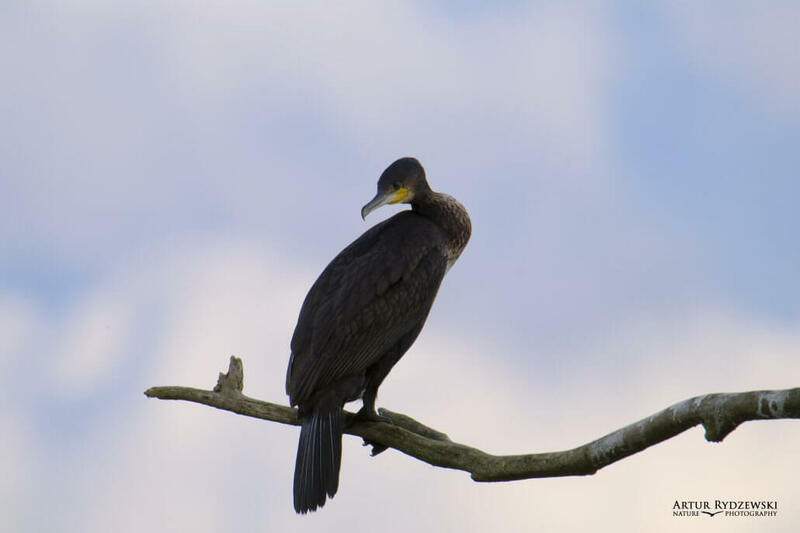 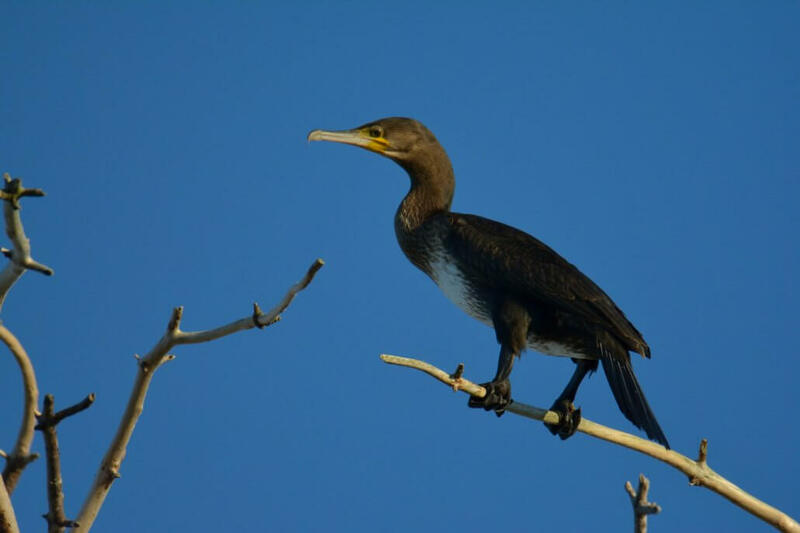 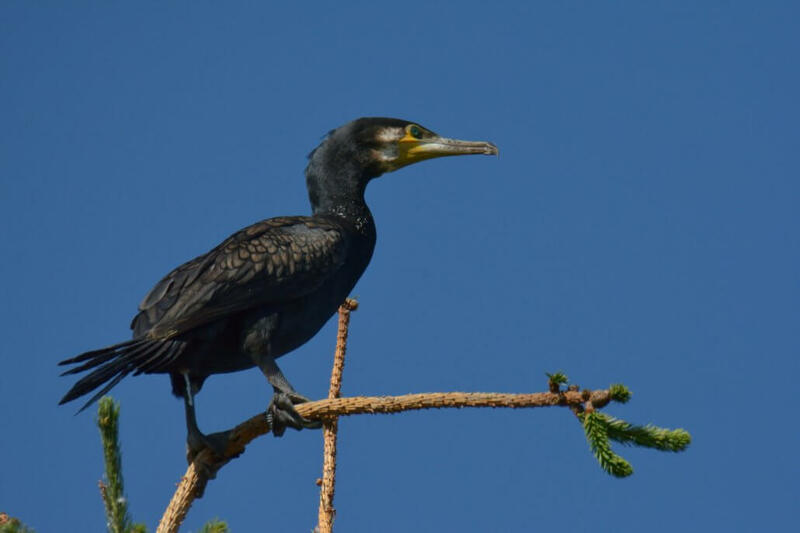 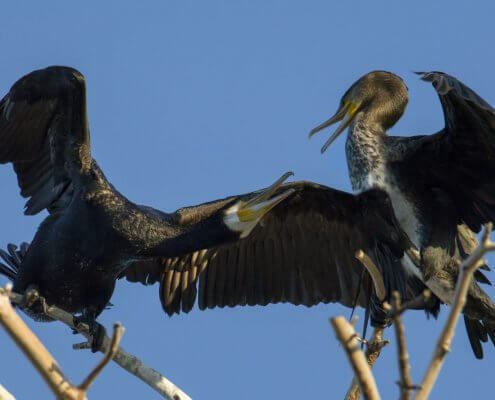 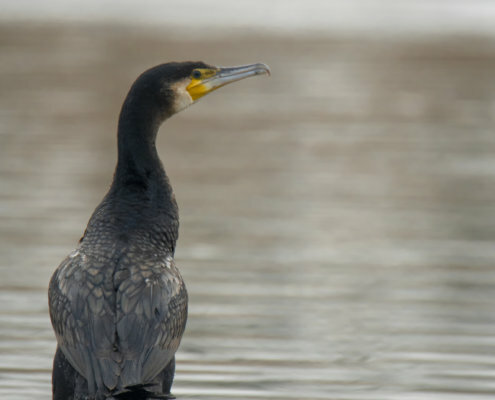 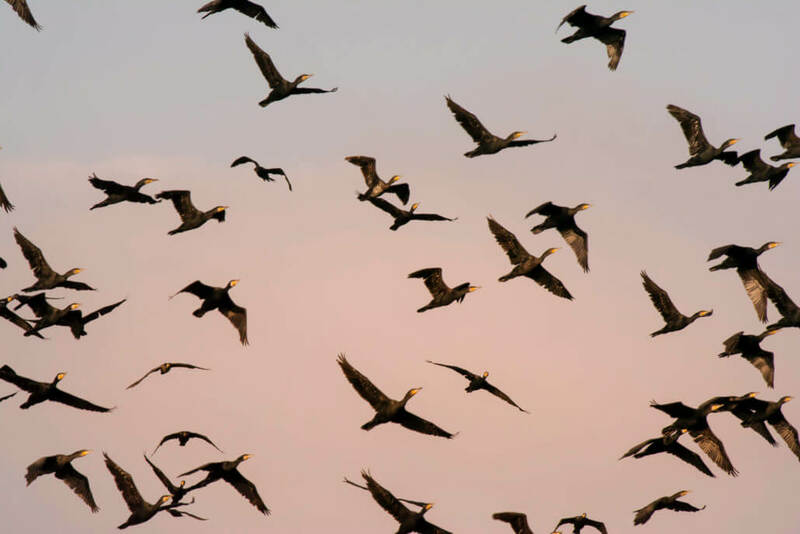 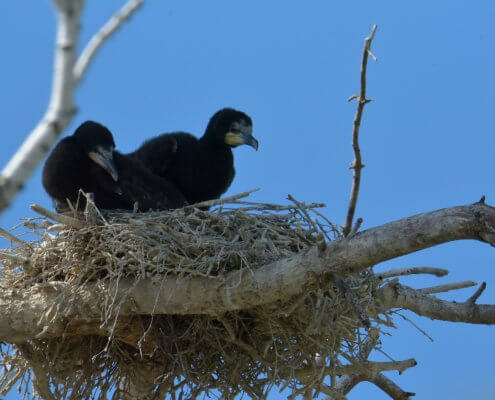 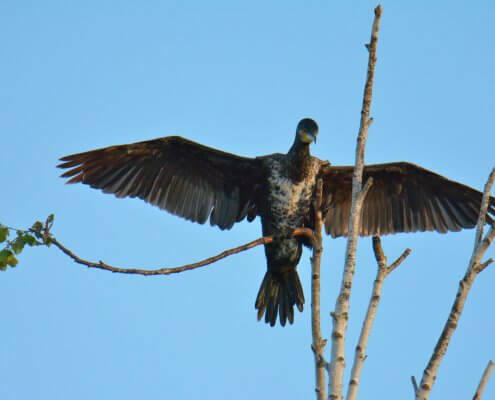 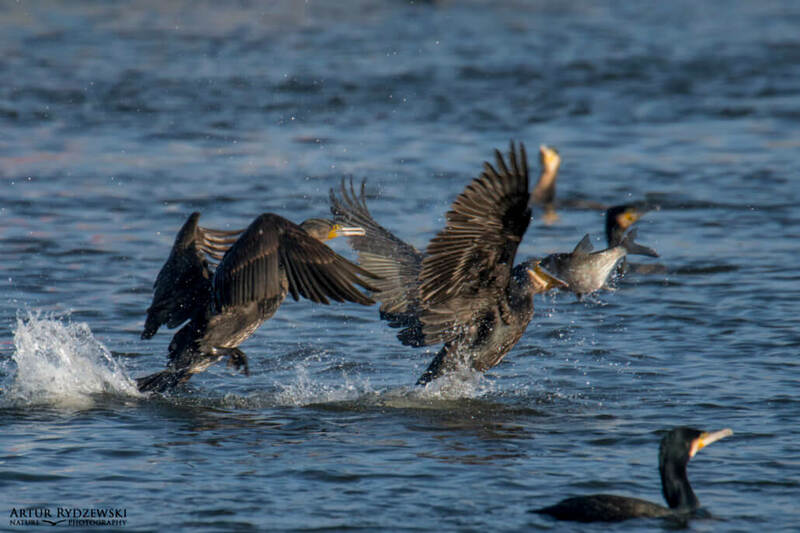 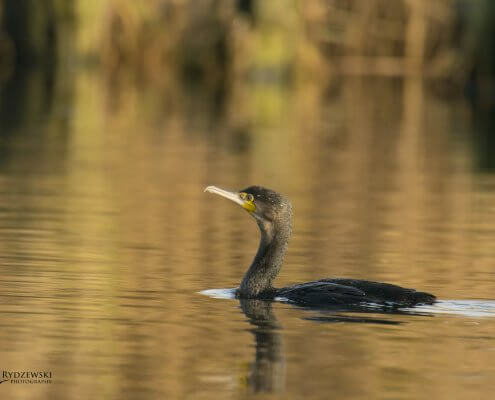 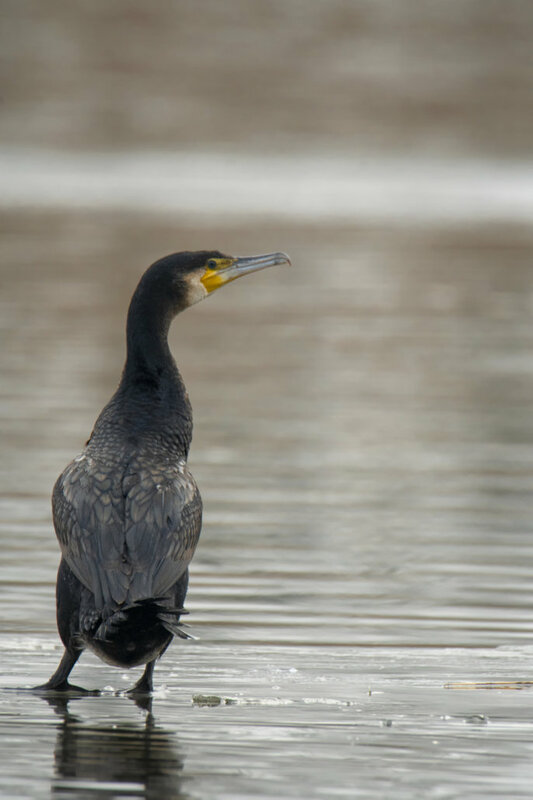 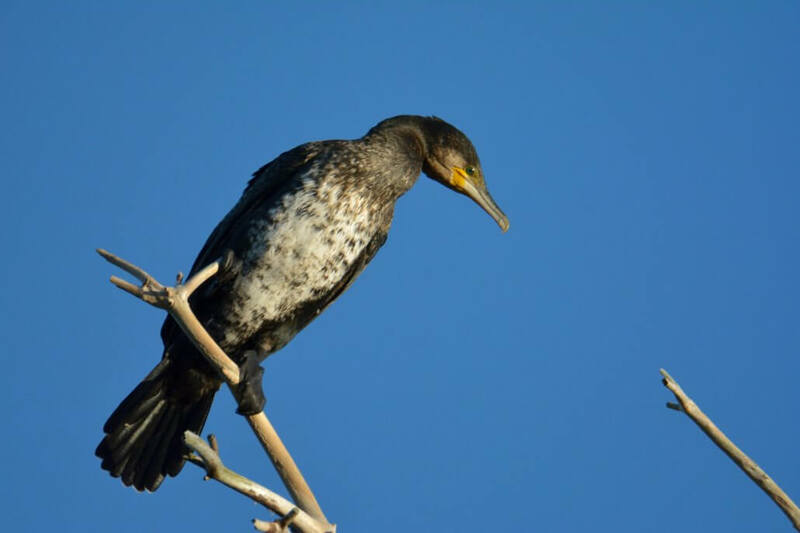 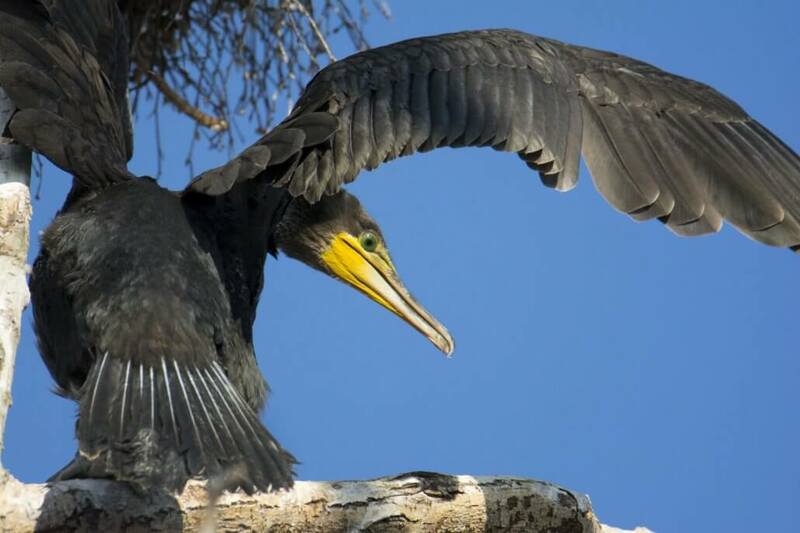 In eastern North America, it is similarly larger and bulkier than double-crested cormorant, and the latter species has more yellow on the throat and bill and lack the white thigh patches frequently seen on great cormorants. 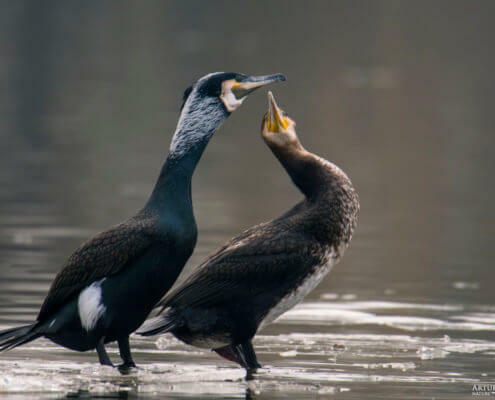 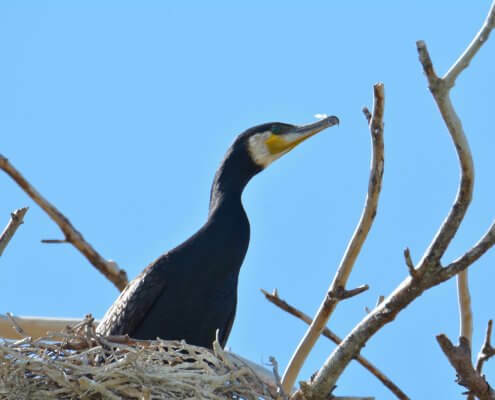 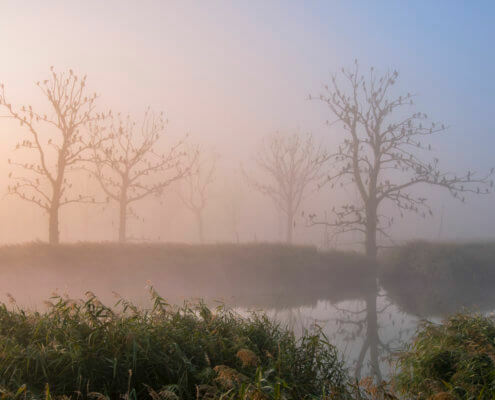 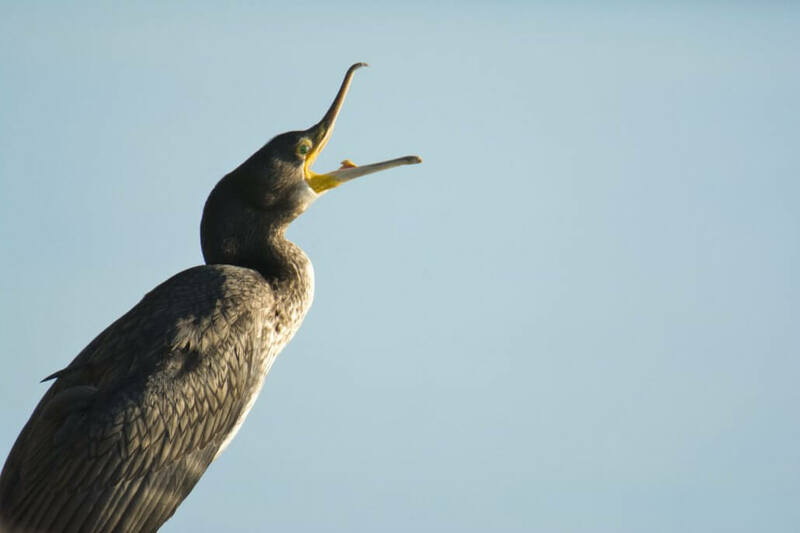 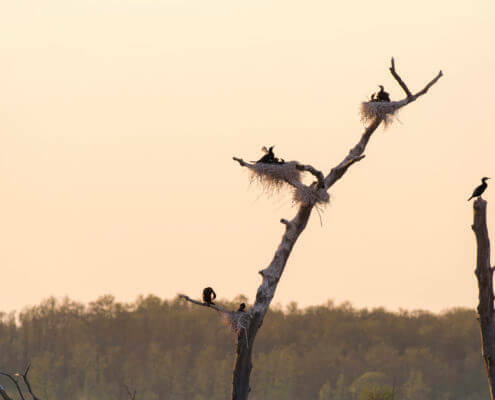 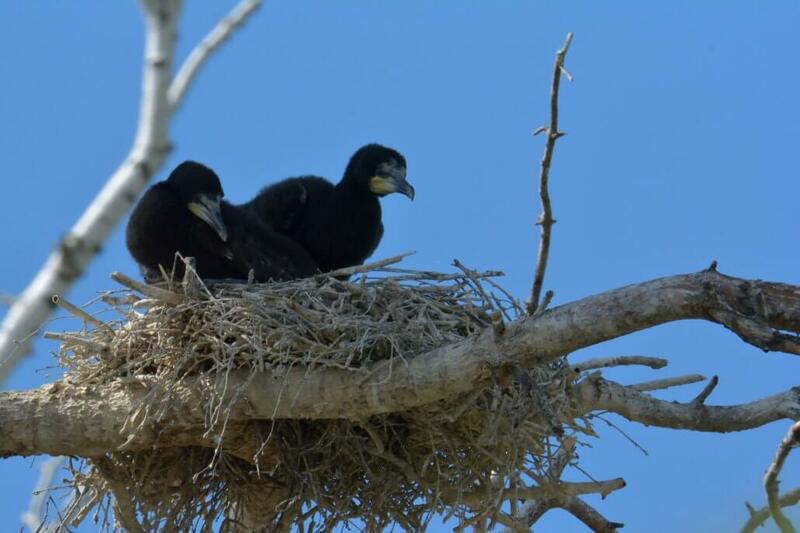 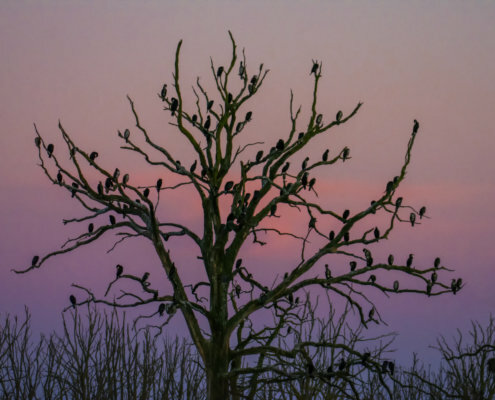 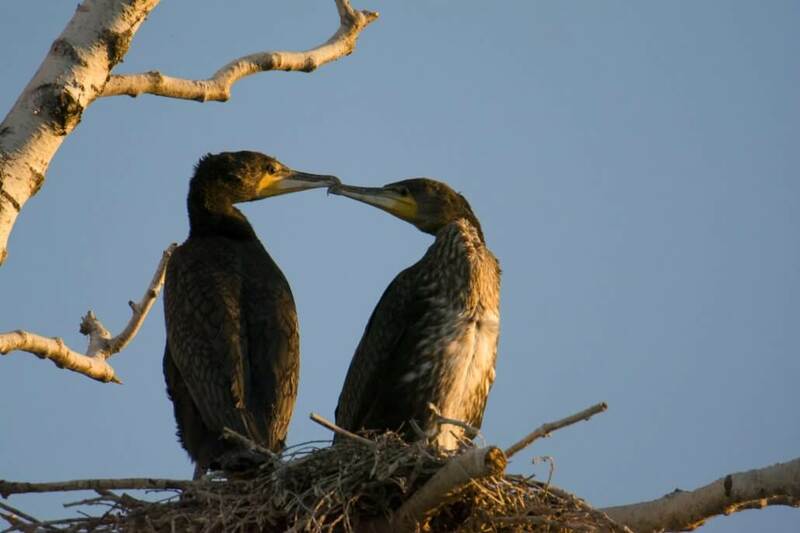 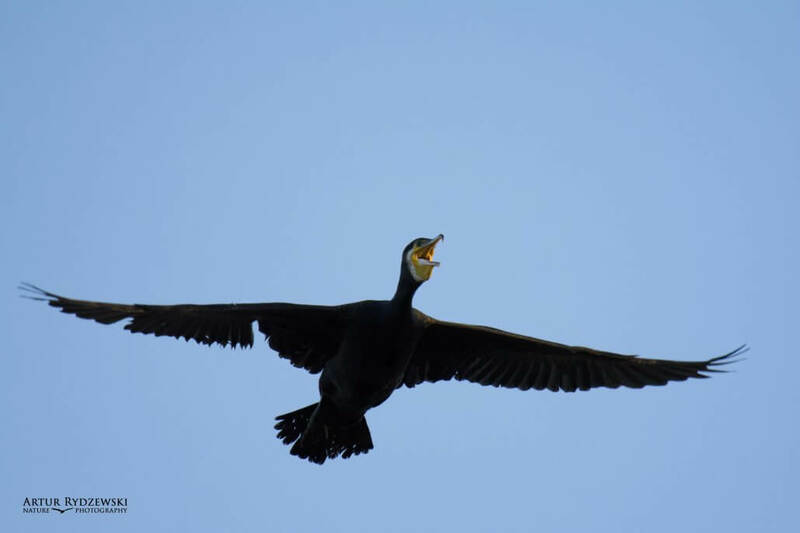 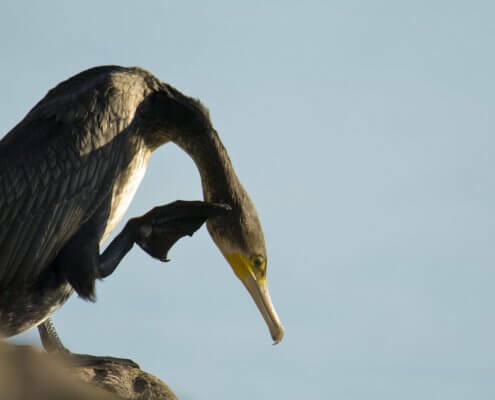 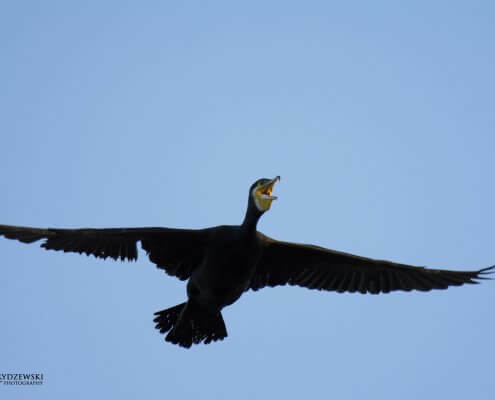 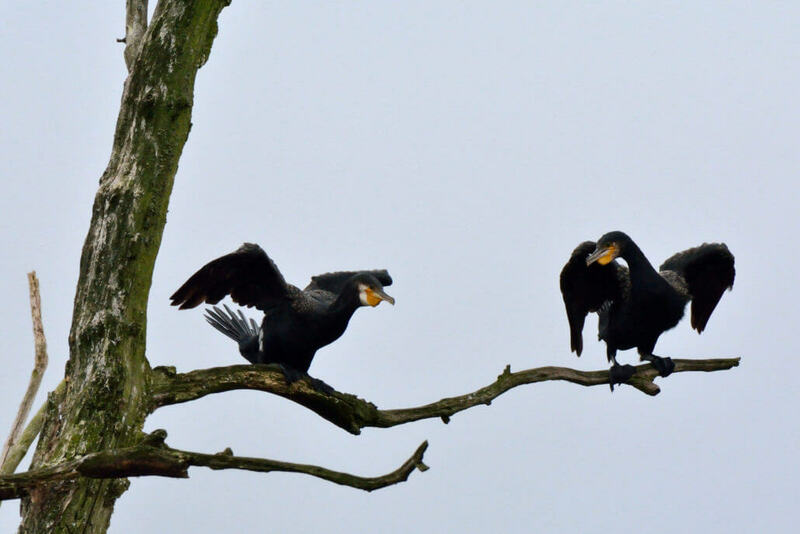 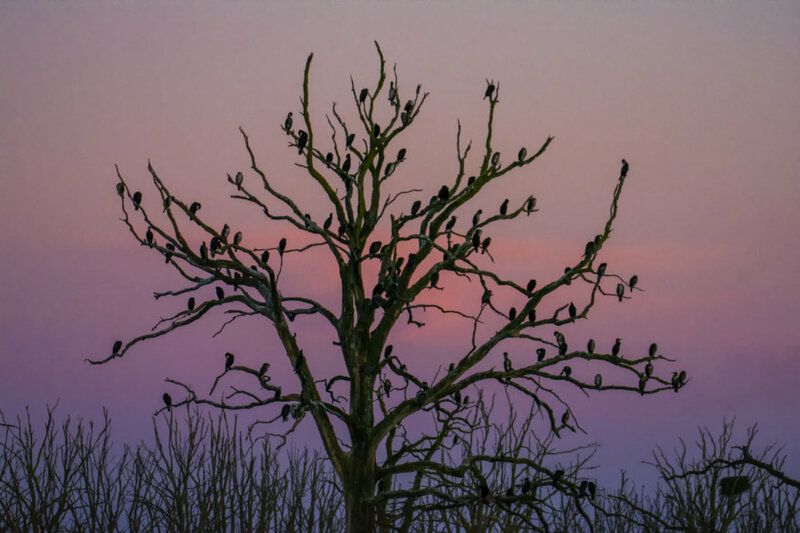 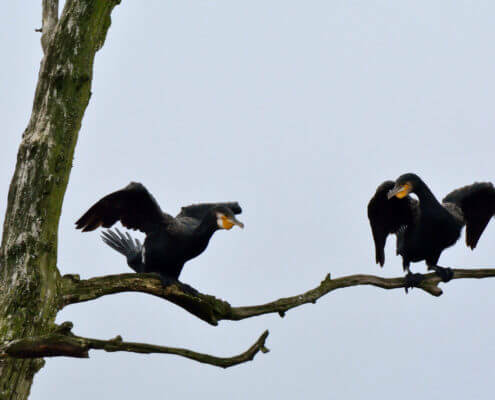 Great cormorants are mostly silent, but they make various guttural noises at their breeding colonies.